SE Asia has been blowing up over the past decade with nomads, digital and otherwise, coming in by the planeload. During the high season it’s almost impossible to find a quiet and relaxing beach. According to those who visited in the 90’s, what was once a beach hut is now a beach bar with a daily booze cruise. We experienced this first hand during our stead in Thailand. We were looking for some solitude not for a party. 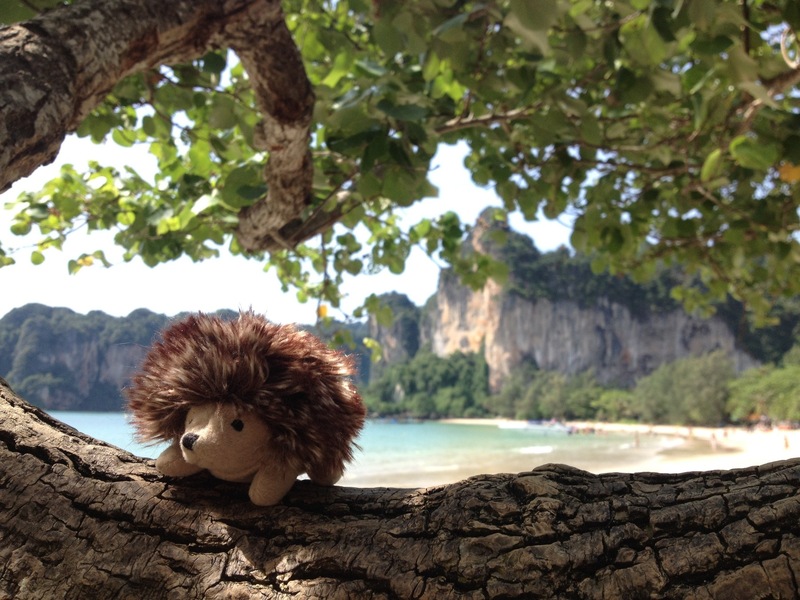 While in Krabi, we decided to do a day trip to the picturesque Railay beach. Longboats packed like sardines arrive at the dock and everyone winds their way to the first available beach. The signage is poor and following the crowd to the aptly named “Farang Beach” is the easiest thing to do. The result of this mass migration is a beach crowded with people and covered in garbage, hardly a relaxing oasis. We couldn’t even find an empty spot to lay down our towels. Railay was not living up to our expectations. Determined to find our little slice of heaven, we picked up our things and found our way back to where we had gotten off the boat. Cutting through all of the hotels and resorts, we searched for a more private beach. Then, Voila! It was hard to believe, a humongous and almost deserted beach just 10 minutes away from where we had started. It seemed so strange that not a single person from our boat had made it to this amazing spot. We spent the rest of the afternoon in bliss. So here’s our travel tip: Do some research and find the beaches that are privately owned or attached to resorts. Sometimes you can just wander through like we did in Railay. Other times you have to fork over a couple dollars to get access to these hidden gems. Either way it is well worth the effort if you are looking to avoid the crowds and the trinket pushers. Paradise Beach, Phuket: We highly recommend this beach to anyone who needs to escape the craziness of Patong. For a $2 entrance fee you get a bathroom, a beach chair, an umbrella, and a far more relaxing experience. Sohka Beach, Sihanoukville Cambodia: Here you can pay for full day access to the resort’s private swath of white sand and their awesome pool. Shea and Sarah, a culture curious couple, left their home in Colorado and set off for Southeast Asia. Follow them and their stuffed hedgehog, Herbert, for travel stories from the heart and travel tips from their blunders abroad. Now that is an amazing find! Judging from your pictures I definitely prefer Railay West over the crowded Farang Beach. You just have to look for the gems. Great advise! I lived in Singapore for a few years and had to learn this the hard way haha! I went to Railay beach several years ago – so sad that it is now covered in garbage. Wow. Oh my gosh, how crowded does Railay look?! We are considering going there for a week during wet season (we live in Chiang Mai), so hopefully it won’t be this crowded! Great suggestions! I went to Phuket, Koh Samui, Chiang Mai…but would’ve been nice to had seen some off the beaten path beaches while there. This was great, thank you!! I can’t wait to go to the beaches in Thailand… and when I go I prefer to be unbothered by the party scene or people trying to sell me things and crowds. I have to bookmark this!! Great photos and great tips too. Southeast Asia has some of the best beaches in the world. I’m honestly impressed you managed to find a secluded beach! I haven’t been overly jumping to get to SE Asia yet just because of the mass crowds and tourism, though I will take your advice and do my research before hand. I really wouldn’t mind forking over a little bit of cash if it meant escaping the crowds! Thanks! !